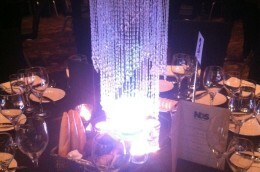 Tall Crystal Hanging Centrepiece on cylindrical vase and LED. Soft light and very effective. Architectural print in cylidrical vase, with chain and LED tubes encased in Dome. Effective and smart masculine style centrepiece. Tall 60cm vase with white pebbles, LED light and palm leaves. Tall flute vases on LED base with fresh lillies and greenery.